Interested in adding your own tip? We would love it if you shared your idea with us. Please fill out our contact us form and let us know. From time to time you might find that you need to find the location of the theoretical intersection of lines. This tip will show you how to add a node on the theoretical intersection of two lines in a sketch. You’ve selected a clear plastic appearance, but the part is not transparent. This tip will show you how to make it transparent. You would like to have an assembly show some parts in wireframe like the image below. This tip will show you how it’s done. Loop selection is a fast way to select all the entities in a closed profile of edges. This tip shows you how to use it to speed up the process of converting edges to sketch geometry. In this tip, you will learn how to insert pictures into a sketch. The Trim command in the Sketch Command Manager is a fast way of trimming entities to other entities, but what do you do if you trim too much? This tip will help you quickly solve this problem. This tip will show you how you can quickly add a note box to any SolidWorks file. This quick tip will show you how you can drag sketch entities that are already fully defined. This quick tip shows you how you can save Time and Money while working with SolidWorks. One of the benefits of SolidWorks is you can copy files to create new ones, so it’s good practice to know your options for copying files. This tip shows you your options. This tip shows you how to use and customize a new feature in SolidWorks 2014 that tracks changes to your part and assembly files. This is a quick tip on how to quickly change views in SolidWorks. This is a quick tip on how to use multiple view angles to view parts and assemblies in SolidWorks. This is a quick tip that will show you how you can hide or show items like axes, grid lines, origins, and more. This is a quick tip on finding the True Length of an arc. This quick tip shows you how to use the Trim command. When you make changes to your parts, wouldn’t it be nice if you could see altered dimensions in your drawings? This tip will show you a setting in SolidWorks that will do just that. This is a quick tip that shows you how to create Custom Views in SolidWorks. This quick tip shows you how to add a Note to a Drawing in SolidWorks 2013. This is a quick tip that shows you how to access the Shortcut Bar and how to find tools or commands in the Search Commands window. This is a quick tip on how to use the Magnifying Glass in SolidWorks. This is a quick tip that will help you navigate your assembly and find those illusive parts. This is a quick tip that shows how you can remove the Command Manager from the top of the screen and dock it to one of the sides, or let it float. This quick tip shows you an easy way to add Fillets by clicking and dragging them from the Feature Manager. There is a new View tool in SolidWorks 2013 called the View Selector. You can access it by clicking the down arrow of the View Orientation command and then selecting it from the menu. 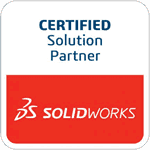 The SolidWorks forum can be an invaluable source of help and information. Anytime you have an issue while using the program, you can almost always find the solution on the forum. An outstanding feature of SolidWorks is the ability to lock features in a model so they cannot be modified unless you unlock them. This not only safeguards the features, it also speeds up rebuild time. Explore fast ways of creating a new sketch and learn the fastest way to do it. You’re working with SolidWorks when you realize that you can’t select what you want and the pointer looks like this. Learn how to customize the SolidWorks Shortcut Bar so that your workflow will be quicker and more efficient. Learn all the ways to navigate the views in SolidWorks to increase the speed and productivity of your workflow. The Dynamic Mirror tool lets you create symmetrical sketches faster saving you time. It also allows you to preview symmetrical geometry in SolidWorks while you’re sketching. Reusing sketches allows you to create parts with fewer sketches. This results in a less cluttered Feature Manager and makes editing easier. When you have to make a change you only need to edit one sketch. Mirror SolidWorks sketch geometry to save time – especially when creating more complex profiles.